I ended up with the flu this past week. First time in more than 12 years. But it got me. I made these the day that I was starting to get sick, but I was still in denial. I was SURE I was just getting a bad cold. Nope. But luckily I didn’t lose my appetite while I was sick. And these leftovers called my name all week in the frig. I had to make a deal with the hubby to split the last of them, we both loved them so much. We enjoyed these topped with a dab of sour cream, chopped avocado and my homemade tomatillo salsa with its tangy taste, which is a nice complement to the other sweet and savory elements. Preheat oven to 450*. Line a baking sheet with foil. In a bowl, toss the potatoes with 1 tsp oil, 1 tsp cumin, 1 tsp chile powder and 1/2 tsp salt. Arrange potatoes on baking sheet. Roast for about 10-15 minutes, depending on how small you cut them, turning once. In a large skillet, heat the remaining 1 tsp oil over medium-high heat. Saute onion until tender. Add remaining 1-1/2 tsp cumin, 1-1/2 tsp chili powder and stir, cook for 1 minute. Mix in black beans. Add kale and 1/4 cup of water and stir well. Cook until kale is wilted down. Add roasted sweet potato and cook until potato is heated through again. Stir in remaining 1/4 tsp salt, or to taste. Add more cumin and/or chili powder as desired. Heat a skillet or griddle on medium heat. Add a drizzle of oil and allow to heat through. Lightly fry corn tortillas in oil on both sides. 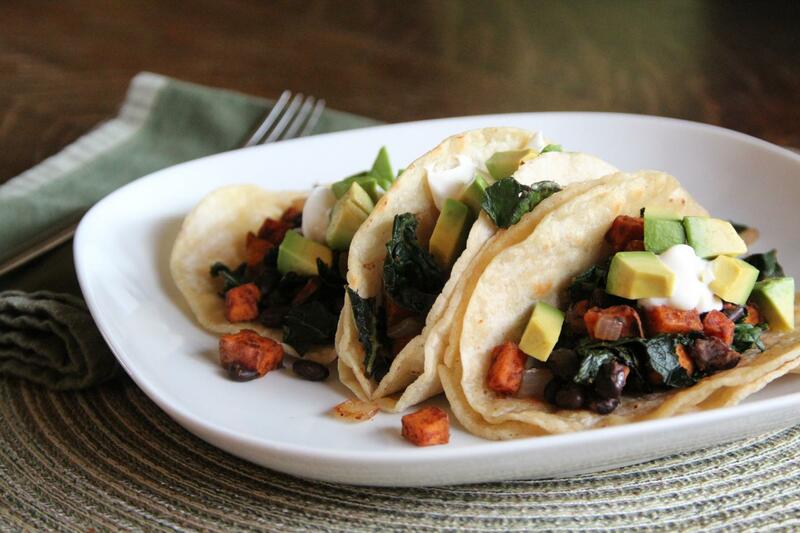 Assemble tacos with sweet potato mixture, sour cream, chopped avocado and tomatillo salsa in corn tortillas. I used to love the Gardenburger Black Bean Chipotle Burgers, before they changed the formula. They used to be labeled gluten free. No longer. Boo. Now the only choices for gluten free veggie burgers are Sunshine Burgers,which are okay, and Amy’s Bistro Burgers, which are pretty good. Or you can make your own. I have only made homemade veggie burgers once or twice before and I can’t remember the results being that great as they didn’t become part of our normal repertoire. But I have seen a lot of veggie burger recipes floating around the blogosphere these days. And recently, over at Gluten Free Homemaker, Linda posted a round-up of burgers on Gluten Free Wednesdays, some of which were vegetarian. So it had me thinking and looking around for some inspiration. This is what I came up with. And yes, this is a keeper. 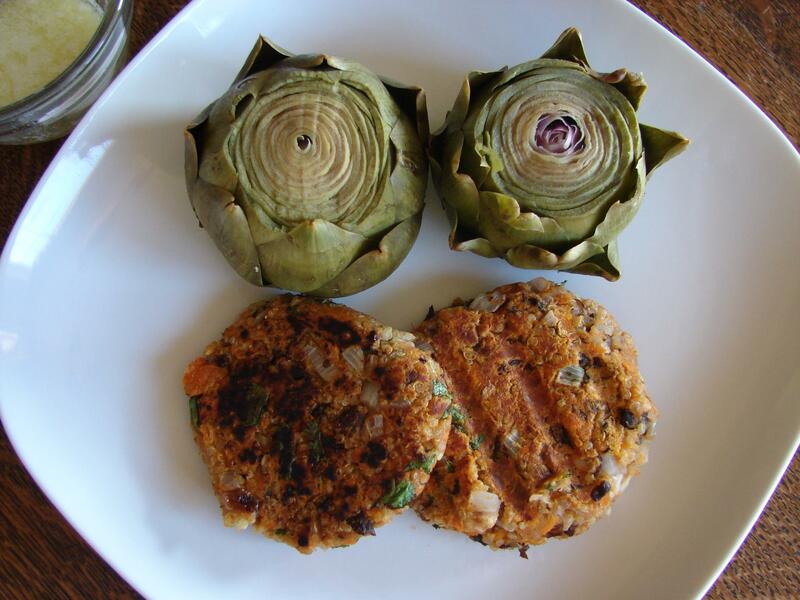 We ate our burgers bun-less with some baby artichokes (yes, an unusual combination). Later that week I ate the leftovers bun-less with some barbecue sauce and pickles and that was great too. The barbecue sauce was a nice companion to the sweetness of the potato. I also experimented with the cooking method. Half of the burgers I pan-fried in a little bit of oil. The other half I cooked on my little-used George Foreman grill. We preferred the pan-fried ones as they held together better and they browned slightly. It seemed like the grill didn’t cook them much at all. In the picture above, the burger on the right was done on the grill (you can still see the grill marks) and the burger on the left was pan-fried. * I microwaved two large sweet potatoes and then split them open and scooped out the inside and mashed it up. * You could saute the onions and garlic if you desire but I liked the slight crunchiness of the raw onion in the burgers. * I used leftover quinoa, so I measured 1-1/2 of that after cooking. I am not sure how much you would need to cook in order to end up with 1-1/2 cups of cooked quinoa. * Chipotle peppers in adobo sauce are not always gluten free, some have flour added. Double-check. Open the can, dump it all the food processor and whirl it until it is evenly blended and the whole peppers are all blended. Then take out what you need and freeze the rest. I never use a full can all at once and typically just use a teaspoon or so here or there. I keep it in a freezer container and scoop out just what I need. * I think I might add more chipotle next time. 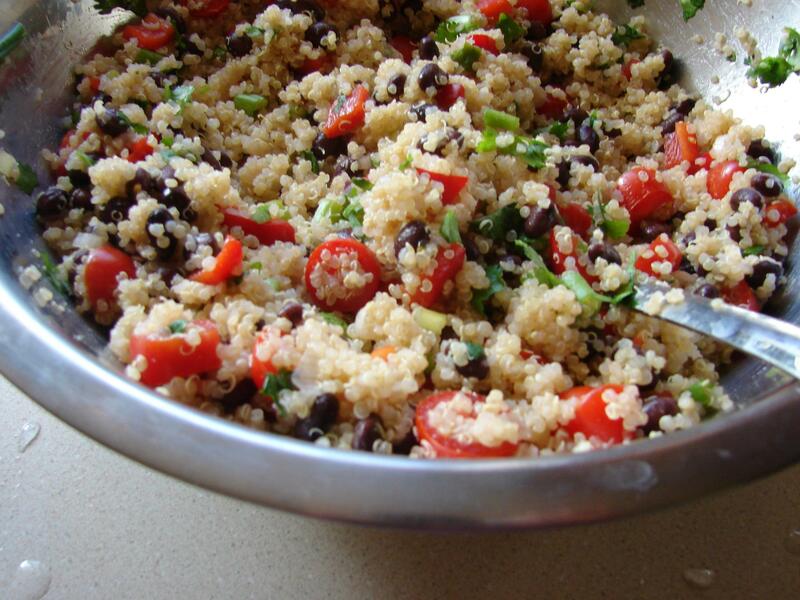 Over the years, I have made quinoa salad quite often, usually with the same standard ingredients of black beans, cilantro and tomatoes. Quinoa pairs well with these flavors but this time I wanted to change things up for a slightly different flavor. I liked the slight sweetness in this dressing from the agave nectar. So, try it, and let me know what you think. Cook quinoa in water according to directions. Let it cool. Whisk dressing ingredients together in a bowl. Combine all other ingredients except the avocado in a large bowl. Add cooled quinoa and pour dressing over the top. Mix well. Gently fold in avocado and serve. * You can substitute the agave nectar with honey if you’d like.